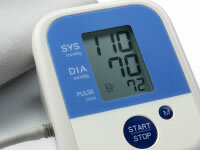 High blood pressure, or hypertension, is common in people with diabetes. Reports from 2012 show that high blood pressure affects 50% of people with diabetes. Blood pressure is important as it is linked with a higher risk of diabetes complications. The symptoms of blood pressure may not show unless blood pressure becomes very high and so it is important that your blood pressure level is checked each year. The first number in a blood pressure reading is known as the systolic reading, which is the pressure of your blood when your heart beats. The second number is the diastolic reading, which is the blood pressure between heart beats. The blood pressure targets set by NICE are slightly different depending on your type of diabetes. If you have diabetic nephropathy (kidney disease) or two signs of metabolic syndrome, the target is 130/80 mmHg. If you have nephropathy, retinopathy or have cerebrovascular disease (which includes stroke) the target is 130/80 mmHg. The NHS regards an ideal blood pressure reading as being below 120/80mmHg. The target is to get your blood pressure below both of these numbers. The NHS notes that high blood pressure is a 'silent killer'  as there are often no obvious high blood pressure symptoms. See high and low blood pressure symptoms for a more detailed video guide. Download a FREE reversing complications guide for your phone, desktop or as a printout. Diagnosis of high blood pressure is usually diagnosed by a doctor or nurse taking your blood pressure level via a pressurised sleeve put around your arm. The test can be taken quickly; however, it’s important that you are calm and rested when the test is performed. If the reading is high, the doctor or nurse may wish to re-test in case the result is falsely high. Stress is recognised as being responsible for higher than normal readings. People with diabetes should have their blood pressure checked at least once each year. Treatment for high blood pressure may either involve lifestyle adjustments and/or medication. The NHS states that medication will be recommended if your blood pressure is over 140/90mmHg and you’re at risk of heart disease within the next decade. Medications for high blood pressure include ACE inhibitors, calcium channel blockers and diuretics. Beta-blockers and alpha-blockers used to be recommended but are these days not so often prescribed because their side effects and drug interactions may outweigh their effectiveness compared to other drugs. Lifestyle changes will involve keeping your salt intake low, taking regular exercise and stopping smoking. High blood pressure is related to an increased chance of complications, particularly in people with diabetes.